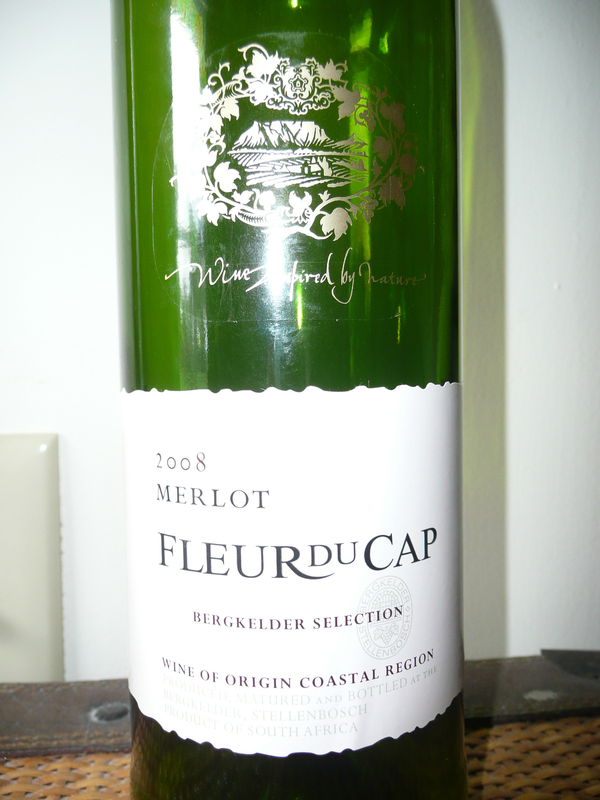 RECOMMENDED: 2008 Fleur du Cap Merlot. Stellenbosch, South Africa. 13.5% alcohol. $8.99. It’s a great time to be a Frugal Wine Snob—the whole world has opened up. We’re no longer limited mostly to California and European wines (as we were 25 years ago), a large percentage of which used to be cork-sour by the time they arrived at their destinations. Today, we have access to magnificent wines being made on every continent. As a result, tremendously surprising wines (like this one), and terrific prices (also like this one), are widespread. Wines from Spain and New Zealand/Australia have made my “Tops” list several times recently, and I’ve also begun to pay attention to an area on the Cape of South Africa: Stellenbosch. This 2008 Merlot from Fleur du Cap comes from that region. Color: Dark clear garnet with orange at the edges (drink now). Aroma: Bacon (I kid you not! ), oak, vanilla, ripe berries. Taste: The dominant taste on the first few sips was bacon. Just amazing! It opened up into a full-bodied, round wine with big, huge fruits, and even a few very slightly floral whiffs. The bacon taste/aroma diminished some, but it was in place throughout. Herbs, grass, pepper, oak, vanilla, a little bit of zingy spice at the back of my tongue. WINE SPECTATOR: Light and fresh, with good plum and grilled herb notes backed by a shading of toasted vanilla. Drink now. WINE ENTHUSIAST [2005 vintage]: Meaty, savory aromas and mouthfilling berry and spice flavors give this big wine dimension and personality. Smooth tannins and good acid/fruit balance keep it varietally true, but needs an equal wine pairing—think roasted game or grilled meat. This entry was posted in Merlot, South Africa. Bookmark the permalink.